New fungus biofuel | What Car? A recently discovered tree fungus could provide a new green fuel, according to a report on the Guardian's website. The fungus, discovered in the Patagonian rainforest, produces a combination of chemicals similar to those found in diesel. The fungus is called Gliocladium roseum and grows inside the Ulmo tree. It produces a long-chain of hydrocarbon molecules that are almost identical to compounds in fossil fuels. Another significant advantage of the fungus is that it feeds on cellulose, which is a compound that makes up the cell walls in and plants and is indigestible by livestock in effect a waste product. 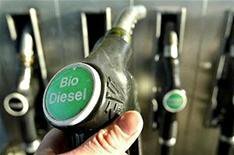 As a result, production of the biofuel would not increase food prices, because no crops would be used in its production process. Details will be published in the November issue of the journal Microbiology.